The first day at school - there's a book for that! The first day at school – there’s a book for that! In the summer before my kids started school, I discouraged people asking them “Are you looking forward to school?” I figured that it’s difficult to ‘look forward’ to something that you don’t know an awful lot about and more importantly, school isn’t ‘optional’ – regardless of whether my kids were looking forward to it or not, they were going! And while they were excited about many aspects of school (the art room, P.E. and the tuckshop), there were some things that made them a little apprehensive (big kids, new rules, finding their way around). Happily, there’s a book that deals with all the ‘first day issues’. 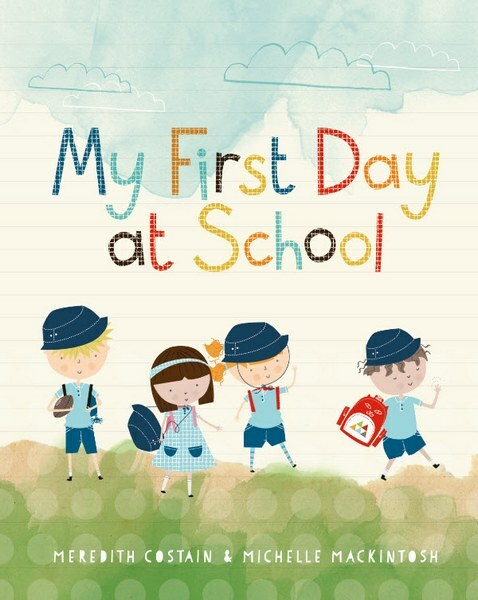 My First Day at School by Meredith Costain and Michelle Mackintosh tackles all the ‘first day of school’ stuff – good and bad, exciting and challenging. The story is written from the perspective of various different kids (after all, we each have different experiences) and begins with Zach’s story, as he enters his new classroom. While Zach’s mum fiddles with his uniform and pats down his hair, Zach is more interested in the computers, a big box of cars and the playground. Amira says goodbye to her mum and finds some familiar faces from her kinder class; Ari feels a little overwhelmed by all the new rules and wonders when it’s lunchtime; and Zoe learns the importance of listening to the teacher. 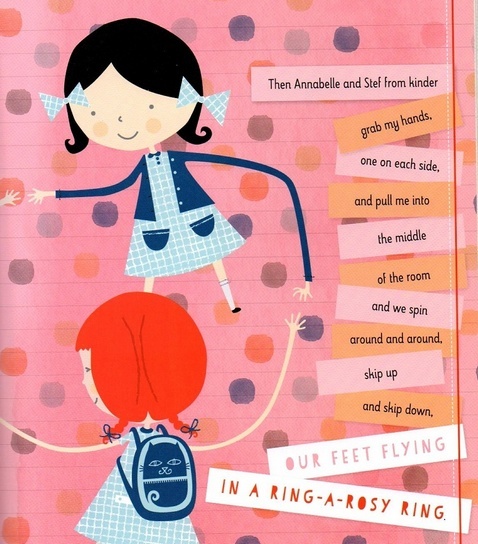 As their first day unfolds, the children experience everything from choosing a partner, negotiating the playground, doing some ‘work’ and of course, hearing the bell at the end of the day. There’s lots to recommend My First Day at School, most notably its honesty. The overall message is extremely positive however the story realistically includes small setbacks and triumphs along the way. For example, as he’s about to sit down to do some drawing, Ari finds that there’s no room left at the table. He feels alone but another boy soon waves him over to a free spot and Ari goes on to draw “…the best picture in the whole wide world”. These experiences may seem inconsequential to adults but can mean a lot to a five-year-old! Michelle Mackintosh’s mixed media illustrations shine – flat, cartoon-like characters and graphics are overlaid on lined paper, each page treated with watercolour to change the mood, the scene and character. Find My First Day at School online at Windy Hollow Books. Then check our archives for more good books about starting school, including The Kissing Hand, Follow the Line to School and Starting School.